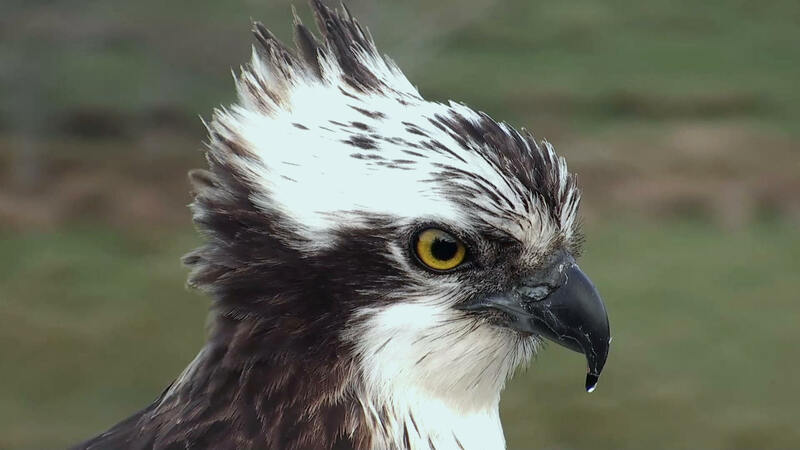 Mrs G was first discovered breeding in the Glaslyn nest in 2004. It is also possible that she was the female osprey that a male was seen displaying to in 2003. It was mid-summer, the time we would expect to see two and three year old ospreys prospecting for partners. How old is she? As she is not ringed we do not know her exact age and previous history, but we do have a few clues that might indicate her possible age. It is known that three year old birds tend to arrive during April and two year old birds tend to arrive from late May onwards. We know the exact date the chicks were killed in 2004 and can estimate their approximate age from their plumage. By working the dates back we can guess that Mrs G would have arrived approximately around the 20th April that year. Spot on for a three year old bird. We know for certain Mrs G arrived on 22nd April in 2005, further supporting the case that she was a probably a young female. Younger females also tend to have smaller broods, there were only two chicks in 2004 and only two eggs hatched in 2005, although three eggs were laid. So we can guess that Mrs G was probably hatched in 2000 or 2001. Making her 16 or 17 years old now. How many eggs has she laid? At least 42 to date, we will never know how many she laid in 2004, but we do know there were at least two. Apart from the two chicks that were killed in 2004, she also lost a chick in 2006 (the eldest, shortly before fledging) and 2007 (the middle chick at 16 days old – it had been knocked across the nest by a very lively mullet a couple of days before, maybe this was connected). Ochre 11 was hatched at a nest near Aviemore in 1998, before being taken to Rutland Water in July that year as part of the ongoing translocation project. At Rutland he was a fairly dominant youngster, frequently taking fish from other birds in his holding pen. He was released on 7th August and took an hour to leave the pen. Surprisingly given his subsequent history, he spent several weeks around the vicinity of the reservoir. He was never spotted at Rutland Water as an adult. In the mid-summer of 2003 local birdwatchers were sure they had seen a male osprey displaying and it was believed that a second osprey was around. It was too late in the season for breeding, but it was hoped that there was a prospecting pair present. In 2004 11(98) was discovered breeding at the Glaslyn nest with Mrs G, although the pair lost their two chicks when the nest slipped during an unseasonal storm. It is very likely that 11(98) was the male osprey that had been seen displaying to a female in 2003. He wore his ochre plastic darvic ring with the number 11 until 2007, when he confused everyone by arriving back without it. He did not appear to like flounder and was never seen to bring one back to the nest. His favourite fish were mullet and trout and he could often be spotted fishing at Pwll McAlpine, along the Porthmadog Cob. He was a very distinctive osprey and it was always a welcome sight when he was spotted fishing from the cob. He was last seen on 4th September 2014 when he was 16 years old. Unringed male, arrived at Glaslyn on 30th April 2015. Named because he kept flying in the direction Nantmor when he first arrived and from the visitor centre he appeared to be flying towards Yr Aran, the mountain peak south of Snowdon. It was also an easy name for to pronounce for non-Welsh speakers. 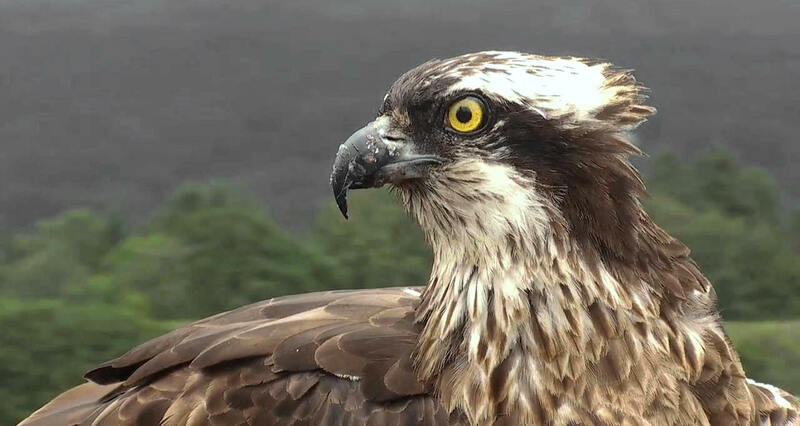 Aran arrived at the time we would expect to see prospecting two or three year old ospreys. His behaviour during his first breeding year suggested that he was not an experienced male and his plumage was not what we would expect from a more mature male. Matings were less frequent than we had seen with the old pairing and he appeared rather unsure of how to behave when left alone with the young chicks. For instance when the chicks were around two weeks old, he made no attempt to feed them when Mrs G was absent for several hours chasing away intruding ospreys, even though they were food soliciting for the fish he had bought to the nest. He is a great provider of fish however, bringing back a large variety of marine species, such as garfish, flounder and sea bass, as well as trout and mullet. He proved to be more experienced in the mating stakes during his second breeding year, as he was also spotted mating with Blue 5F. In June 2016 he demonstrated that he was more confident with the chicks, by feeding them himself for the first time. Hatched at the Rutland Site K nest in 2012. Her mother is the satellite tagged female White 30 (hatched at the Rutland Site B nest in 2005) and her father was the translocated Rutland male Red 08 2001. In December 2013, Blue 5F was photographed by Chris Wood at Tanji Marsh in Gambia, she was 18 months old at the time and would not yet have made a return journey to the UK. In December 2014 Chris returned to Tanji Marsh and he again found 5F settled for the winter there. She had not been spotted back in the UK during the summer, although it is likely she would have travelled north as a two year old. On 9th April 2015 Blue 5F was captured on camera again, as she landed on the perch of the Glaslyn nest, this was the first sighting of her in the UK as an adult. She remained in the Glaslyn area during the summer and intruded at the Glaslyn nest on several occasions. By the middle of October we heard the news via Fansu Bojang and Chris Wood that 5F was back in her wintering quarters in Tanji Marsh. On 29th March 2016 Blue 5F landed on the perch at Glaslyn once again. 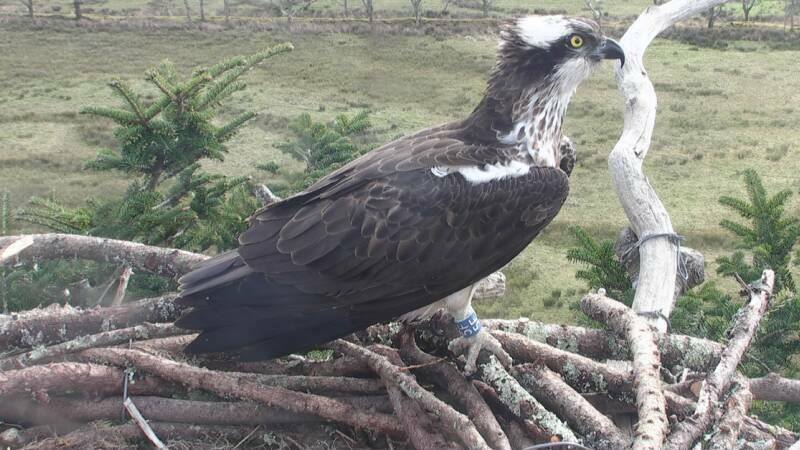 Two days later she was in a skirmish with her cousin Blue 24 at the Dyfi nest. 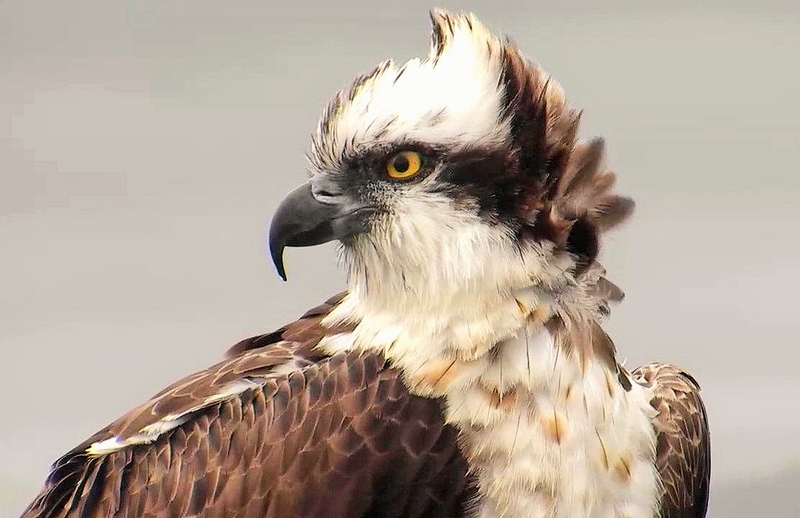 Glesni, another cousin, who is the resident female at Dyfi had not yet returned. Before long, 5F was back on a favourite nesting platform in the Glaslyn area. Aran was spotted mating with her on several occasions and for a while she appeared to be incubating eggs. The nest failed however and 5F soon resumed her regular intrusions at the Glaslyn nest. During the autumn/winter of 2016, 5F was once again settled in her wintering quarters in Gambia, where Chris Wood photographed her for the fourth consecutive year.